With some practice most of us can guess-timate range out to 300-400 yards with enough accuracy to make a decent shot with a flat shooting rifle. Beyond that a rangefinder is required equipment unless you decide to utilize one of the ranging reticle systems like the Holland ART, Shepherd Scope, or the moa or mil reticles. All of these reticles are based on the formula that Range = height of known object x 100 / moa. 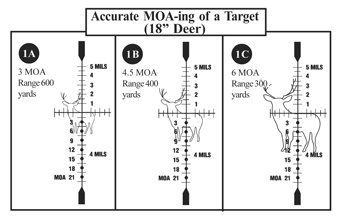 For example knowing a deer's body is 18" high then Range = 1800 / moa. For Elk its 24" or Range = 2400/moa. 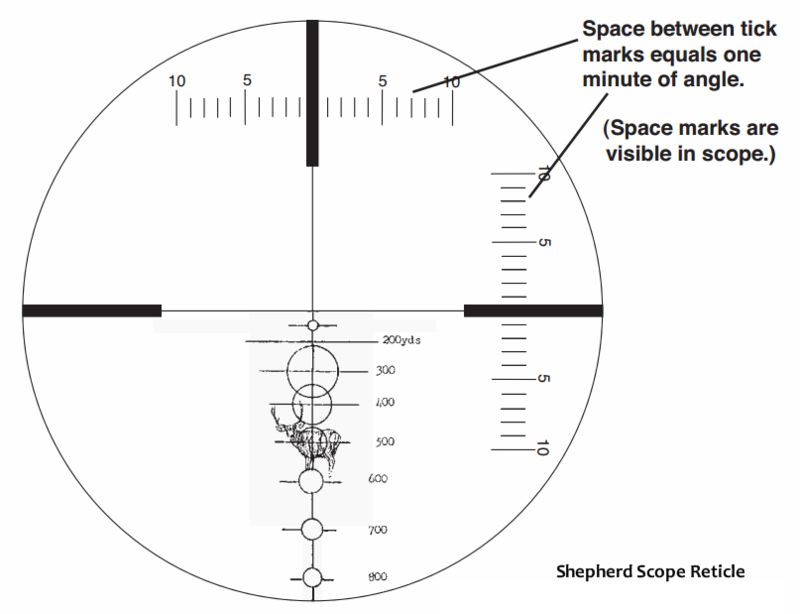 Combining Ranging and holdover the unique Shepherd Scope was the standard for long range shooting long before laser range finders became readily available. Just find the circle that matches the height of the game and pull the trigger. Scopes can be ordered to approximately match your rifles ballistics and then fine-tuned. With the availability of laser rangefinders this scopes popularity is no longer what it used to be though for speed of use out to 600 yards it's a pretty good scope for under $900 - tho I wouldn't recommend any scope without turrets for extreme long range shooting. 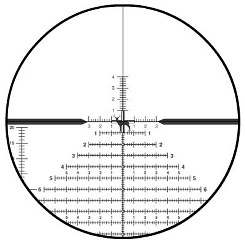 You will note on this reticle one of the drawbacks of ballistic reticles - at 900 yards you are using the very bottom of the glass where aberrations are most prominent and there is very little room for wind hold-off. Taking the reticle markings to the extreme is the new Horus Reticle which has marks corresponding to every ¼ moa click of the turret allowing exact holdover without using the turret. The military is moving towards this reticle as it is faster and has no moving parts compared to dialing turrets. The primary drawback is it uses moa or mils while most hunters prefer yards and the fact that in low light the lines can be more difficult to see. With an Illuminated scope though this drawback can be avoided. If you are shopping for both a scope and a rifle you may want to consider a complete package from a long distance shooting vendor which guarantees an accurate rifle, scope and ammunition properly matched to each other so you can hit a 1000 yard target right out of the box. Vendors include well-known Gunwerks, McMillan Firearms, Best of the West ( Huskemaw), Fierce Firearms, Thompson Long Range Rifles ( 30-378), Hollands Gunsmithing, Long Range Rifles ( Len Backus) and others. Most of these also offer long range shooting training consisting of a day or two of shooting and instruction. Gunwerks LR-1000 precision action, Stainless Steel. LH available. Gunwerks long range hunting stock with aluminum bedding block and molded in color. Scope rings and bases are pinned to the action, and secured with 8-40 screws. Heat-stress relieved match grade barrel with 5 land/groove configuration, Stainless Steel. Match chambers designed for long range secant ogive and standard bullet profiles. Calibrated for Gunwerks long range ammunition or a custom load. Jewell target grade trigger built to withstand harsh hunting conditions. NIC Industries Ti Cerakote metal finish. All weather double rifle shipping case, airline approved with wheels for transport. Scope rings and bases, and Gunwerks scope coat included. McMillan EOL Mountain Extreme rifles are built for the EOL Mag series of cartridge with very long, high-VLD bullets that are seated out longer than usual to free up additional powder capacity inside the case. The result is higher velocity and less bullet drop at extreme ranges. McMillan's EOL Mountain Extreme rifles feature long actions, ejection ports and magazine boxes that can accommodate .338 Lapua and other similar length cartridges.ranges where standard rifles and standard cartridges are at their design limits.